Suit therapy at Revivo has been a good experience. The therapists are great. 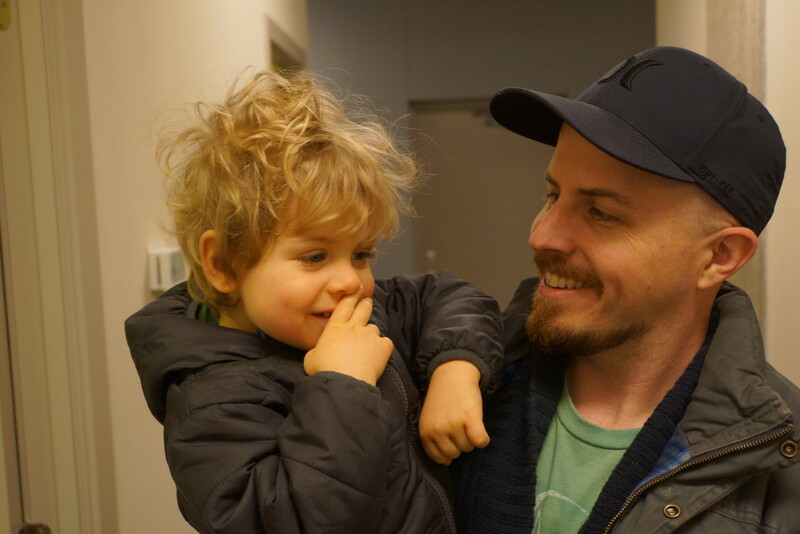 The ability to get to know and recognize the differences between Edison and Jaxon was very nice to see. The therapists are very knowledgeable and do an excellent job making connections with Jaxon. Jaxon doesn’t warm up to everyone, if he likes you it is very obvious and he definitely likes and feels comfortable at Revivo with both therapists. It is rare to bring him into a place where he needs to work very hard and he is smiling and laughing. Our goals when we began, were to see improvement on current skill sets and hopefully gain new skills. I feel Edison has achieved both goals and continuing to improve on the skills Revivo has opened to him. The experience with Revivo has been very good. I feel everyone involved has a lot of drive and determination to meet the goals set out for Edison. Working with children with special needs is very challenging. The therapists working with Edison were extremely calm, patient and very personable. I have appreciated the attention to detail and the way the therapists have really gotten to know Edison in such a short period of time. Edison was always happy to arrive at Revivo because the therapy was made fun for him. My expectations of the therapy were fully met. First off, I wanted to see improvement in my daughter’s head control, and after the first week, saw a noticeable improvement. Nick is exceptional. He is so patient and knowledgeable, kind and professional but most importantly, he genuinely cares about his little patients. He ”speaks” to them in a way that is heartwarming to watch. He communicates with the parents in a manner that is easy to understand. The therapist and staff were very accommodating from start to finish. This is the therapy clinic to come to if you want to see positive change in a positive environment plus with positive energy throughout. I am very thankful to Nick and his wonderful PTA Judy for all the effort. It was a very positive experience. All the staff were amazing, made my son feel very welcome and accommodating. The treatment in itself was more than I expected. Nick (Physio) is a very kind and gentle man. My son was excited to go to do his treatment. The gains that I noticed immediately were the “using of two hands automatically”, the vocalization, more body awareness and confidence. Thank you Revivo, you give hope to parents like myself. We are so thrilled with the results we have seen over 3 weeks here at Revivo and working with Nick. Taliyah’s confidence has bloomed and her strength has increased. Working with Nick has been amazing. He has been able to connect with Taliyah in such a way to motivate her all the while she has had so much fun. Nick (PT) has been so insightful to us too. Anything that we have asked he has been able to provide an answer for with fundamentals behind it to heighten our own knowledge. 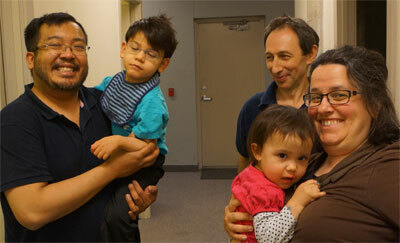 Coming to the Clinic for three weeks has been an overall pleasant experience and we have built great bonds. We would definitely recommend the Clinic to those interested in this method of therapy. My 4 year old son experienced brain trauma due to an accidental fall when he was a tiny three week old infant resulting in an eventual diagnosis of Cerebral Palsy. Since the accident, my husband and I have been trying different therapeutic approaches, from traditional to alternative, in an attempt to awaken his brain: NDT, Cuevas Medek, Dolman, Anat Baniel Method, even swimming in a Snoezelen sensory pool, were just some of the therapies we’ve tried. They all provided small changes but not enough to trigger real and progressive development of his brain’s ability to control movement. 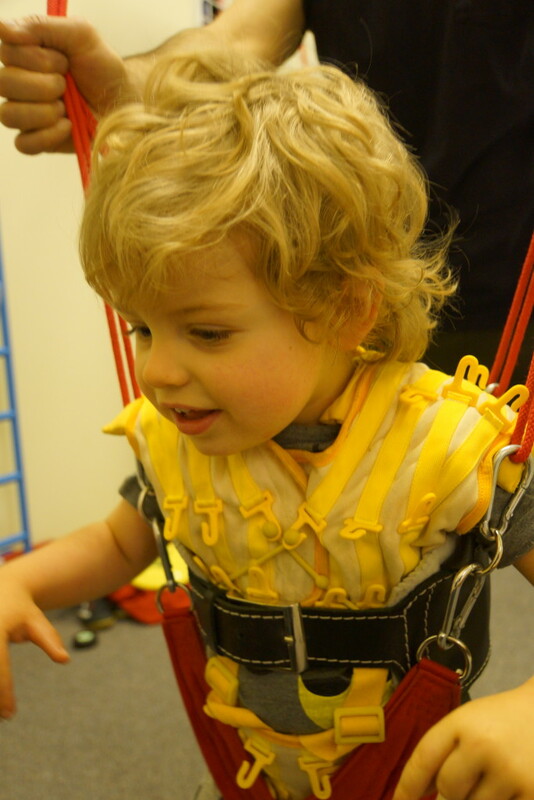 The exciting news is that Intensive Suit Therapy, provided by Revivo in Scarborough, is sending the right kind of sensory stimuli to our son’s brain teaching him that he does have the capability to coordinate and control his trunk and move his body. It seems the training while wearing the suit has provided better integration of sensory and functional brain centres, not only improving coordination of movement and strengthening his trunk, but also improving his visual and listening abilities by improving his proprioception awareness of where he is space. It thrills us that he can finally look at our faces and the wonderment in his eyes is awesome! We can now for the first time witness BIG CHANGES in our son in just the last 4 months, whereas we saw only little progress in his development during all of the first 4 years of his young life. He was like a 4 month old for 4 years, but just in the last few months since starting Intensive Suit Therapy, he is finally developing his sitting, rolling, reaching, kneeling and standing abilities to be more like an 8 month old. My son is waking up from a trance… and I see in his eyes and hear in his laughter and tears that he wants to move like other kids, and he will but in his own unique way! He is finally moving through his developmental milestones at the age of 4! This is everything that we have ever wished for and our dream is coming true with Intensive Suit Therapy. We respectfully give our thanks and appreciation for the kind people at Revivo, (especially Nick, his physical therapist), for bringing this therapy to Ontario. The rest of the world regards this therapy as a standard treatment for children with Cerebral Palsy, so we urge other parents of children with a neurological movement disorder to give it a try to see BIG CHANGES happen in their child. We are so happy we had the courage to try one more therapy to help our child reach his fullest potential, and especially glad that it was Intensive Suit Therapy. We now live the DREAM every day with a full heart that our son is being the best that he can BE. My experience with Revivo has been very positive and elating. My family and I have noticed vast improvement in Zain and his ability to do normal day to day activities. I still remember the day I was told that Zain suffers from a neurological disorder called Cerebral Palsy and a very limited list of things he will be able to do on his own. He wasn’t able to control the involutary movements of his hands, or lift his head on his own or be able to sit without any support. Thanks to the TheraSuit therapy at Revivo, some of that has changed. TheraSuit therapy has regulated his movement and now for the first time in a long time Zain has been able to sit on his own without any support for longer periods of time. He is better at controlling the direction of his hands and is able to keep his head from hitting the ground when he falls back. It may not seem like a lot but for someone in Zains’s condition it means far too much than anyone can even imagine. This isn’t our first attempt at a therapy for Zain; but, is the first and only, that showed promising results. It still remains a long uphill battle for Zain but I do take comfort in knowing that we are two steps closer to where I would like to see my son one day, thanks to Revivo team. Furthermore, I will never forget the entire staff that helped us through this. The warmth, the affection and the respect they treated us with has garnished a very special place in our hearts. Thank you for the all the encouragement. Also, on a special note, I would like to Thank Arfa Muzafar, team of ICNA Relief foundation, and all the people who lent their support and made all this possible. My family and I will always be grateful. I was very impressed with my son Thomas’ 3 week intensive block of suit therapy at Revivo Centre this summer. Being new and curious, I was eager to see how Thomas would respond to the input provided by the therapeutic suit and what if any freedom of movement it would provide. Because Thomas lacks the ability to balance and has further difficulty from excessive muscle tone in his legs, he cannot stand independently or walk – both require manual manipulation for safety and coordination. Thomas can also be difficult to engage and motivate and I was unsure how he would manage repeated 3 hour sessions, expecting a lot of “all dones” throughout. I was first very impressed by the skilled attention provided by the staff, mostly 2:1 ratio to keep Thomas engaged fully. 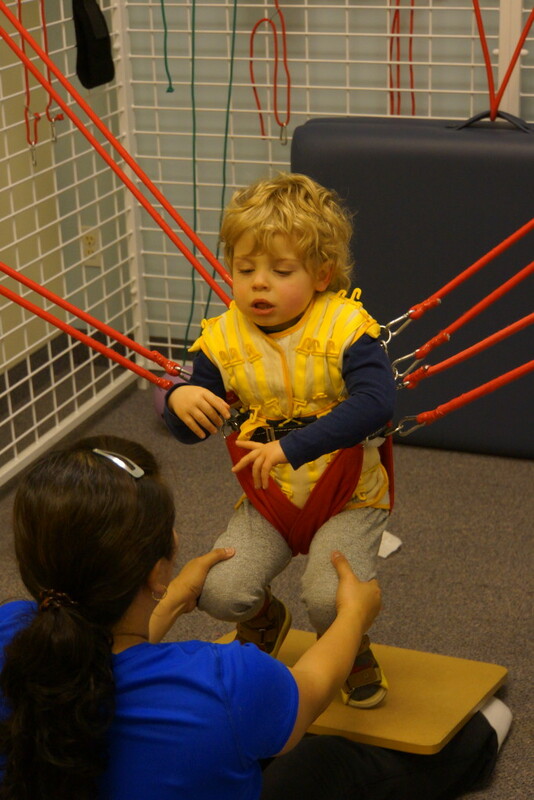 The suit which was worn 80% of the time, provided Thomas with added balance, coordination and more independence! Despite moving constantly which typically results in tighter muscles, Thomas was more limber and he clearly enjoyed the freedom of not being held and guided during movement. I was mostly impressed by Thomas’ participation; he was a trooper throughout and managed to get thru his days paying a lot of attention and actually having fun – especially during his rewarded bike rides at the end, which Thomas did with increased coordination. I believe the suit therapy was very useful and instructional in attaining functional movement and liberation and highly recommend it for children with physical challenges.